Home » Website Building » SEO » How to Link Google Analytics with Google Search Console? How to Link Google Analytics with Google Search Console? Google Search Console and Google Analytics are two important free site monitoring tools for every webmasters. Nowadays, almost every site on the web uses Analytics and Search Console data. Though both of these tools are from Google, you still need to use two different places to view the relevant details. 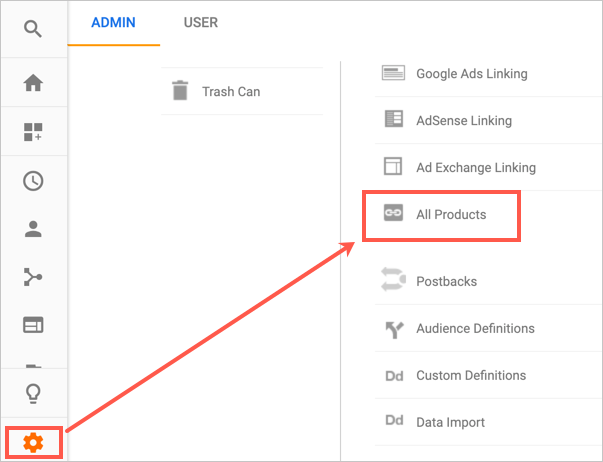 In order to simplify getting all the data in one place, Google allows to share the Search Console data to your Analytics account. This helps webmasters to lookup all related data in a consolidated manner without logging into each account separately. 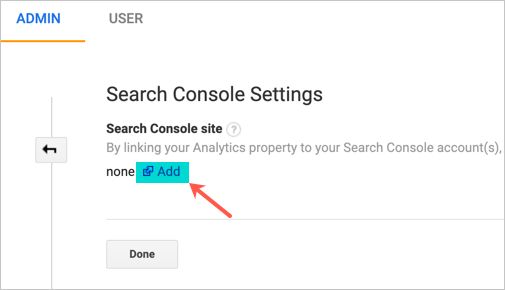 Follow the below steps to enable data sharing between Search Console and Google Analytics accounts. Login to your Google Analytics account and navigate to ‘Admin’ tab. Select the site account you want to link and select the ‘Property’ you want to share the data. You will see the new screen appears on the right side showing the details of the selected property. Scroll down and click on the ‘Adjust Search Console’ button under Search Console section. You will see the ‘Search Console Settings’ as shown like below. Click on the ‘Add’ link. You will see all the available properties in your Search Console account. Here look for the Search Console property of the same site. Ensure the property is already not linked any of the existing Analytics account. If you mistakenly link the wrong the property, then the existing integration will be removed. 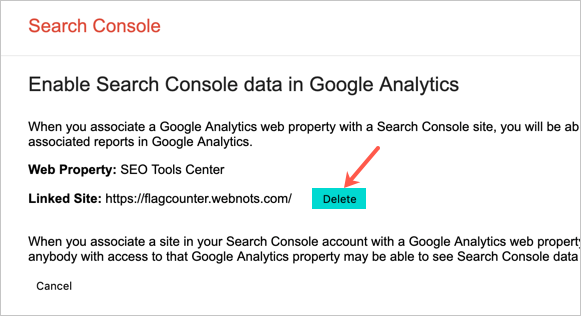 This means you can only link one Search Console property to one Analytics account. Select the correct property and save your settings. Google will prompt you to confirm the association, click ‘OK’ to confirm. 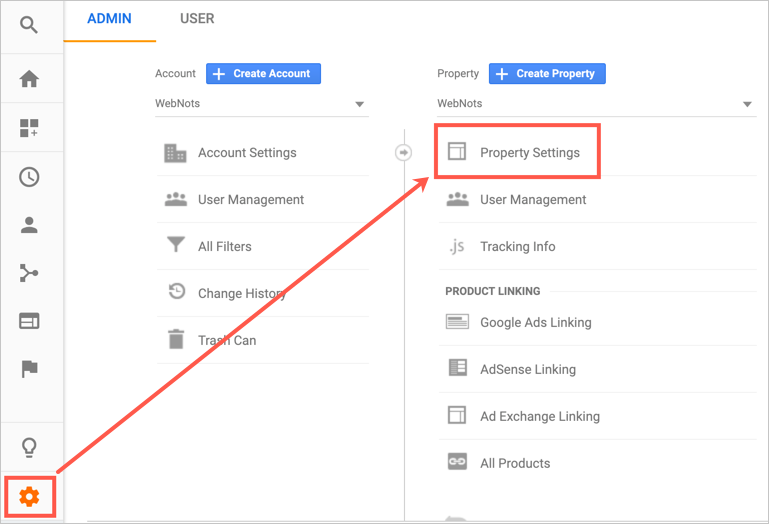 Now go back to Analytics account and refresh the page, you will see the Search Console property is connected to your Analytics account’s property. Any time you can remove the association by clicking on the ‘Delete’ link. And then again confirm the ‘Delete’ option against the linked site. 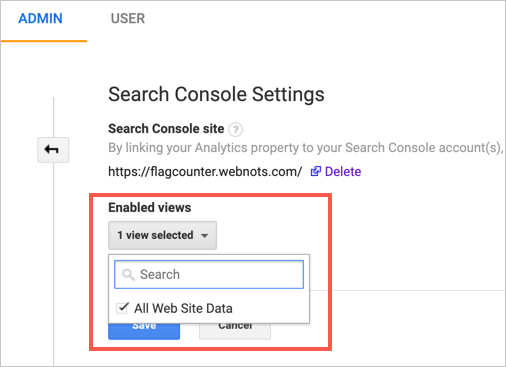 There is also another way to link your Search Console account with Analytics account. 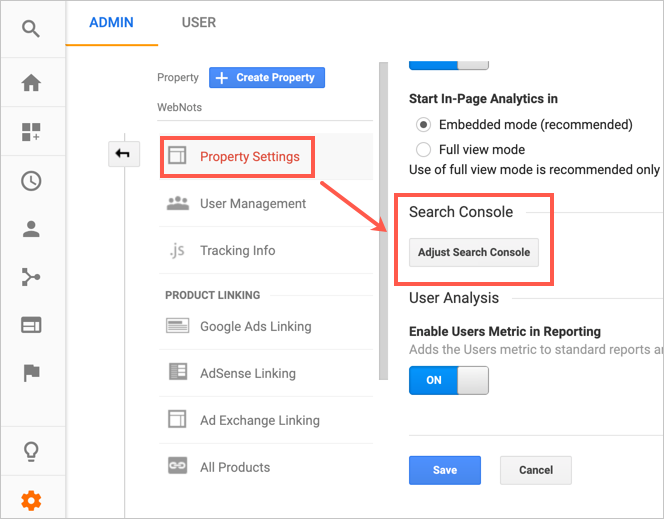 Go to the ‘Admin’ section in your Analytics account and navigate to the required property. Scroll down and choose ‘All Products’ option under ‘Property’ section. From here, you can click on ‘Link Search Console’ button and choose the Search Console property. The remaining steps are same as explained in the above method. Where to View the Data? Now that you know how to link the accounts, the next step is to understand about the data integration. 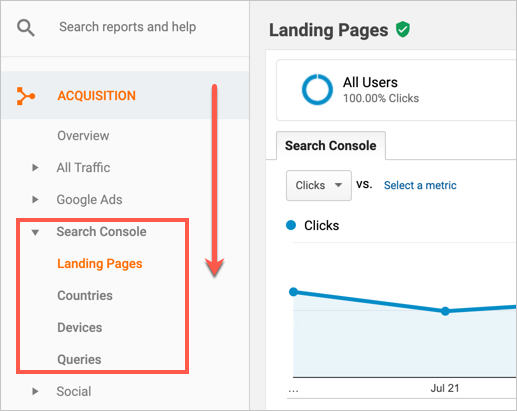 First you can go to your Analytics account and navigate to ‘Acquisition > Search Console’ section. Here you can see all the data pulled from your Search Console account like landing pages, countries, devices and queries. At this point of time the old Search Console holds the data for 90 days, so you can also see the 90 days of historical data in Analytics. The new Search Console (as of now in beta) version will have 160 days of history, and hence your Analytics data. The data is available in both accounts after the collection in Search Console. Also you will only see the data in Analytics after the integration date and not before that. Editorial Staff at WebNots are team members who love to build websites and share the learning with webmasters community. Subscribe to get fresh content from WebNots on your email inbox!! !